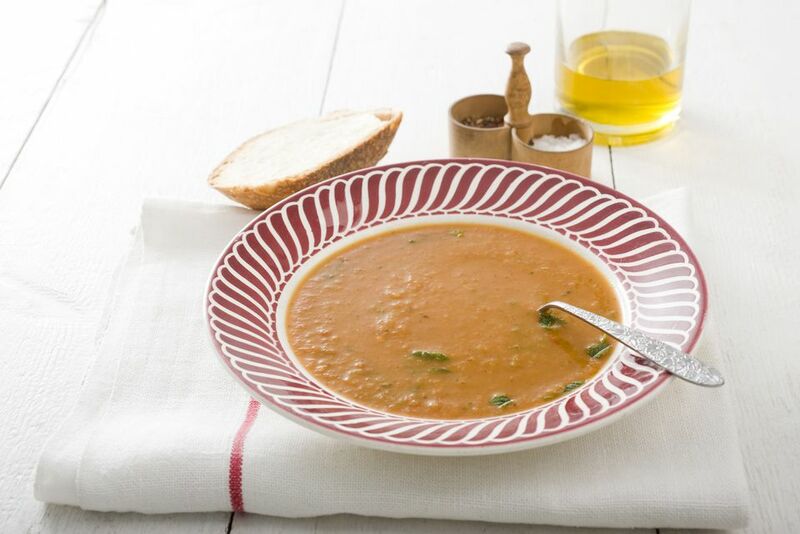 Tomato, basil, and leek soup is a classic regional Italian recipe. This fragrant, creamy soup is especially satisfying during late summer going into early fall when plum tomatoes are at their peak. For a heartier touch, break chunks of day-old sourdough bread into the soup when serving for what the Italians call “Pappa al Pomodoro”. If using fresh tomatoes, peel by cutting a small “x” on the tip, and dropping into boiling water for 1 to 2 minutes, until the skin loosens easily. Crush tomatoes in a bowl so that no juices will be lost. Heat 1 tablespoon of the olive oil in a soup pot over medium heat. Add onion, garlic, carrot and potato and cook for 5 minutes. Add tomatoes, broth, and a healthy pinch of sea salt. Bring to a boil; reduce heat, and simmer, covered, for 25 minutes, until vegetables are very tender. While soup is cooking, wash chopped leeks thoroughly. Heat remaining tablespoon of oil in a skillet. Sauté leeks over medium heat for about 5 minutes, or until leeks are firm but tender. Set aside. After 25 minutes, add the basil leaves to the soup and remove from heat. Puree soup with a vertical wand blender until creamy. Add leeks and season to taste. Cook an additional 5 minutes before serving. If desired, drizzle with extra virgin olive oil when serving.